Like its near neighbour, St Barts, Saint Martin used to be governed as a commune of France from Guadeloupe. However, the island, like St Barts, voted to break away, and become a separate collectivity of France. A process completed by 2007. Initially, the island was coveted by the Dutch and the French, even though it had been charted by Spain first. They had decided that the island was a low priority. The Dutch where the first to make a move, and established several successful settlements on the island. In 1633, the Spanish, already at war with the Netherlands, seized the island and tried to develop it themselves. However, their attempts proved unsuccessful, and they abandoned the island in 1648. After the Spanish withdrawal, both the Dutch and the French jumped back in, and established their own colonies. Not wanting to face war, both sides signed the Treaty of Concordia which divided the island between them. 1 legend has it that to decide how much went to each side, a race was organised between a Frenchman, and a Dutchman. The Frenchman imbibed in wine, whilst the Dutchman enjoyed Jenever, a Dutch gin. Both set off from the start point, and headed round the coast. Where they met, would be where they drew the line to, from the start point. Unfortunately for the Dutch, their competitor met a cute lady, and slept off his drinking, whilst the Frenchman cheated and cut a corner off. This meant that the island was divided in Frances favour. However, this is only legend. The real reason is that France had a thumping great fleet in port. Makes for a brilliant bargaining chip! Over the years, various border disputes between the Dutch and the French has ended up with the French holding about 21 sq miles, and the Dutch, just over 16. 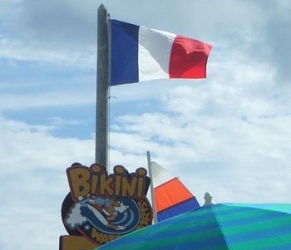 Like many of France's overseas territories, it does not have its own flag. However, it does on land, use its coat of arms on white. There is also a locally designed flag, featuring a white "Y" shape dividing the flag between 2 blue halves. 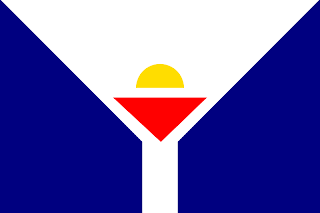 In the centre of the flag is an inverted red triangle, as well as golden half circle. The coat of arms itself features a ship, a sun, a bird, and a palm tree. As well as the territories name.